Update: 20:30 – All eleven people on board are confirmed dead. “We are in shock. This is devastating,” says Coastal Aviation Managing Director Julian Edmunds. Names of the passengers and crew are being withheld pending notification of next of kin. Rescue crews are en route to a plane crash in the Empakaai area of the Ngorongoro Conservation Area. 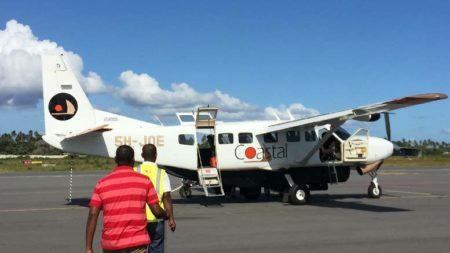 A Coastal Aviation Cessna Grand Caravan, 5H-EGG, with 10 passengers and 1 pilot ‘had an accident … en route to the Serengeti,’ says a press release issued by the airline. The accident happened at approximately 11:00 on Wednesday, November 15, however crews have yet to reach the scene. “No one has been able to reach the site and assess the situation yet, due to the remoteness of the location, but several emergency teams are currently converging from air and land to bring their assistance,” says the statement. This is the second incident involving Coastal Aviation within a month; in October one of their aircraft overran a runway. 3 Comments on "Update: no survivors in remote plane crash"
I am so sorry to hear about this crash. I fly with these guys all the time with clients, the pilots are amazing. Again I feel for all the people involved. My good friend was on this plane, it was their honeymoon and only the second day of the trip. They had a wonderful wedding. I am shocked and I am upset about the comments about the pilots and safety etc. Just a month ago same Arline same plane crashed, everybody survived luckily but two crashes in 2 months! There should be a very tough investigation into Coastal Aviations practices.